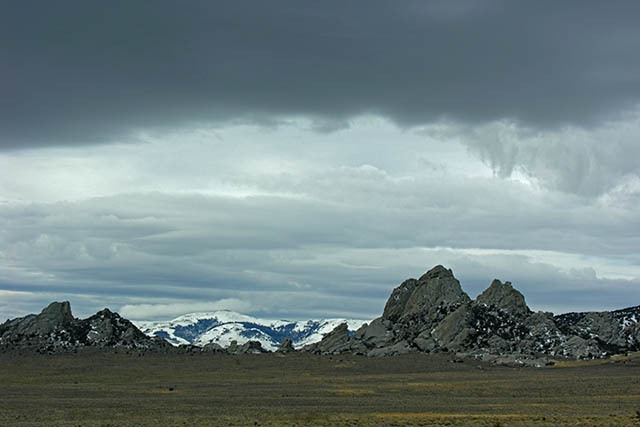 The snow-capped range is the Raft River Mountains (in NW Utah very close to the Nevada border). I love this obscure country, and will be getting out more and more in the future. As a result this blog may need some alternative/guest editors. Hell, Ralph, we’re all trying to get out more! How’s the fly fishing down there, Ralph? Actually I think there are a few of the rare red-banded trout in a few stream sections or springs not too mucked up by livestock. One of THE experts on that part of ID just moved to Missouri. That is actually yellowstone cutthroat trout country, and they are faring poorly. look, too,at how isolated they are. It’s my understanding that redbands, like salmon and steelhead once upon a time, are not found upstream of Shoshone Falls at Twin Falls. Very small streams in that part of the world, and HUGE cattle grazing problems. That small portion of southern Idaho is also the only place in the state where pinyon pine grows (in association with Utah juniper). So the pinyon dependent birds like the pinyon jay and juniper titmice only occur there. And here is a report by THE expert on that part of the world. Red Willow. Here is the Red Willow report I forgot to attach … sorry. I haven’t been to City of Rocks since I was in third grade (we moved out of Burley, Idaho) — it was the place I saw my first wild bobcat. It was a favorite destination, probably because teens could get out there and drink. Albion is still there. I haven’t been to the City of Rocks since they made it a state park and began charging admittance fees. Good place to camp out if you like to climb or just want to spend some time out there. Great shot Ralph, nice winter sky and clouds. I was recently hiking in northern Arizona, some large desolate landscapes in high desert country, saw some amazing sunsets and colors near Wupatki National Monument. Unfortunately, BLM and the Forest now have huge fire bureaucracies who love to gain access to federal fire funds by claiming pinyon is a hazardous fuel and then justifying “treating” it, i.e. kill the trees to try to grow cow grass (and the often get cheatgrass as a result of thier treatment disturbance) in the wake of the burning or chaining treatment. http://www.westernwatersheds.org/watmess/watmess_2005/winter_2005.pdf PAGE 6 … A 1000 acres ripped to pieces by bulldozers. In Goose Creek south of Burley BLM has done “prescribed burns” that have “escaped”. And Ely and Elko BLM in Nevada have desires to do massive pinyon juniper killing projects -paid for by we taxpayers and benefiting cattlemen. And you are right about American pine nuts. Most of the pine nuts sold here are from different species of pine, many actually come from China, are often picked by near-slave laborers, are treated with various nasty preservatives, etc. If you go to http://www.pinenut.com and then follow the links to the Pinenut Food Values Section, the top few stories in the Advocacy Section, History Section, etc. you can get a pretty good idea of what has been going on. Instead of treasuring pinyon in Nevada, Idaho, and Utah, it’s treated as a weed by federal agencies by and killed to benefit the livestock industry. I wanted to feedback about a recent deforestation project being performed under the heading of wild life improvement. I imagine the BLM is also doing it to create more for cows to eat, Nevada being such great livestock country and all. They have held off on developing massive oil deposits in Nevada because of the cost. These projects are just starting to rear their heads. In Modoc County CA I understand there is a 1,000,000 acre deforestation project for biomass fuel. In Nevada there is a 70,000 acre treatment, Western Watersheds is working on it (thank you Katie Fite – super hero) I will try to get more info up on our blogs about these projects. Thank you for your work!